It also typically refers to this specific variation. 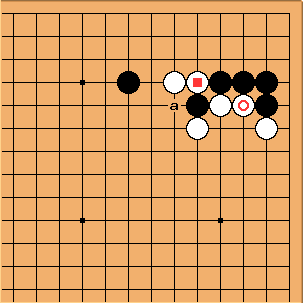 This variation was played in a 1931 game between Tanaka Minaichi(also known as Kato Minaichi) and Go Seigen (White: colours were reversed). It then perhaps went underground for a generation. 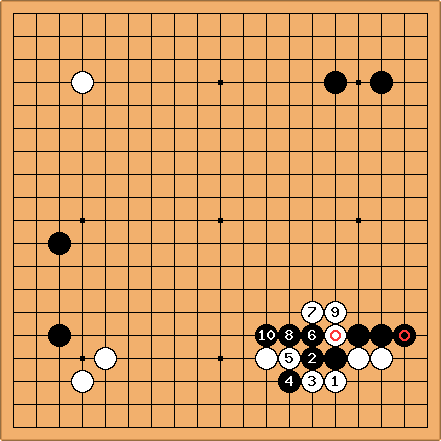 The earliest example in GoGoD (winter 2008 edition) is this 1930 game played in the autumn Oteai. In both the games played in the '30's, the marked cut by White was answered by the marked descent by Black. By the time the variation appeared next in professional play (in 1958) this reply had disappeared. 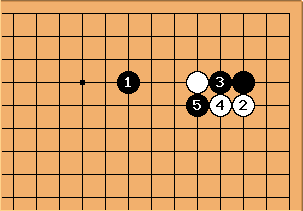 This pattern appears in Ishida's joseki dictionary as White's way to make a peaceful end to this pattern. It depends on the ladder at , which is a prerequisite for White to play as shown here. However, no such variation seems to occur in pro play and this is probably because the result is too good for White. So, Black shouldn't have played the marked move when the ladder works for White. If the ladder doesn't work for White the result is disastrous for her and she should not have initiated this variation herself by playing the outside attachment. That is, was a poor choice. Or, going back further, perhaps White might rethink her original approach at . In any case, the ladder must be good for one player or the other. Since either player can opt not to play this sequence and neither is happy if the ladder doesn't work for her, then this sequence should never occur. This would then be why there are unlikely to be real-life examples in high-level games. 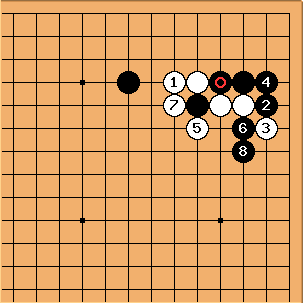 There are several joseki which rely on ladders which neither side should initiate provided both read ahead to see whether or not the ladder is good. 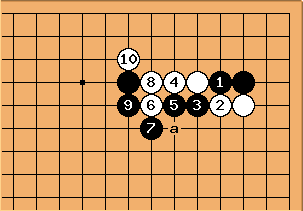 A compilation of just those joseki is to be found at Ladder Joseki. After , there remain many cutting points in the position. Professional games show many variations unraveling into the corner and sides. Incidentally, is not at because of the ladder at a. 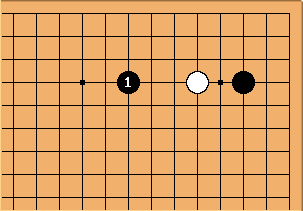 When to use the Magic Sword, a page talking about the variations of this joseki, given the ladders on the other side of the board.